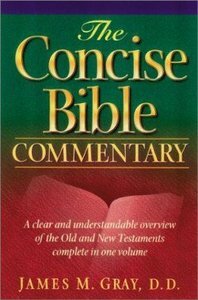 The Concise Bible Commentary provides a clear and understandable overview of the Old and New Testaments in one volume. Designed to supplement the reading of the Bible, it furnishes explanations and expositions, devotional insights, and spiritual guidance in an easy-to-use layout. Following each commentary section, inductive study questions provide an opportunity for review and further reflection.This work is an updated, retypeset version of one of the most popular commentaries of all time, the Christian Worker's Commentary on the Whole Bible. About "The Concise Bible Commentary"
JAMES GRAY was born in Whitemouth, Manitoba and raised in Winnipeg. He began his journalism career during the Depression, writing for several Western periodicals and as a member of the Ottawa press corps. He began writing autobiographical social histories of the Prairies in the 1960s, work that ultimately won him the Canadian National History Society's Pierre Berton Award. He died in 1998.